“Forgiveness is like this: a room can be dark because you have closed the windows, you've closed the curtains. But the sun is shining outside, and the air is fresh outside. In order to get that fresh air, you have to get up and open the window and draw the curtains apart”. It was healing for the soul and reviving for the senses this week to sit looking out at Oraka (Colac Bay) and reflect. We were in the takiwā of Te Runanga o Ōraka Aparima for another hui for Tu Pono: Te Mana Kaha o Te Whānau. The takiwā extends from Waimatuku to Tawhititarere sharing an interest in the lakes and mountains from Whakatipu-Waitai to Tawhititarere with other Murihiku Runanga and those located from Waihemo southwards. The landscape is breath-taking; the chill in the air was sharp and crisp. But what I particularly loved was the placement of a children’s playground adjacent to the whare. You can tell a lot about people from the way they look after their children. In Oraka, the children are protected from harm, allowed to play and do their own thing, while their aunties and uncles, taua and poua, can keep an eye out the window on their precious tamariki mokopuna. While at Oraka I took an opportunity to catch up on the progress that has been achieved with Te Whakaoraka. Te Whakaoraka was the first application to Te Pūtahitanga o Te Waipounamu from Oraka Aparima. The initiative is to create an active, sustainable, regenerative eco-learning space at Te Takutai o te Titi marae (Colac Bay), and for a whānau member to be the kaihautū of this project. The application shows partnerships generated with Department of Corrections (prisoners are propagating and growing native plants); local schools come to the marae to learn about the environmental challenges, there is a te reo revitalization strategy, mara kai, planting days, native nursery. What stood out in their application was a comment from beautiful Taua Jane Davis. “Our river, once treasured by our tupuna for the many mahinga kai values contained within her banks is now polluted with farm runoff and nitrates. I believe there is a need now for people to work together”. The driver behind Te Whakaoraka is Jade McGuire. Jade has co-facilitated two tamariki wanaka; the first around Matariki; the second focused on kōanga. 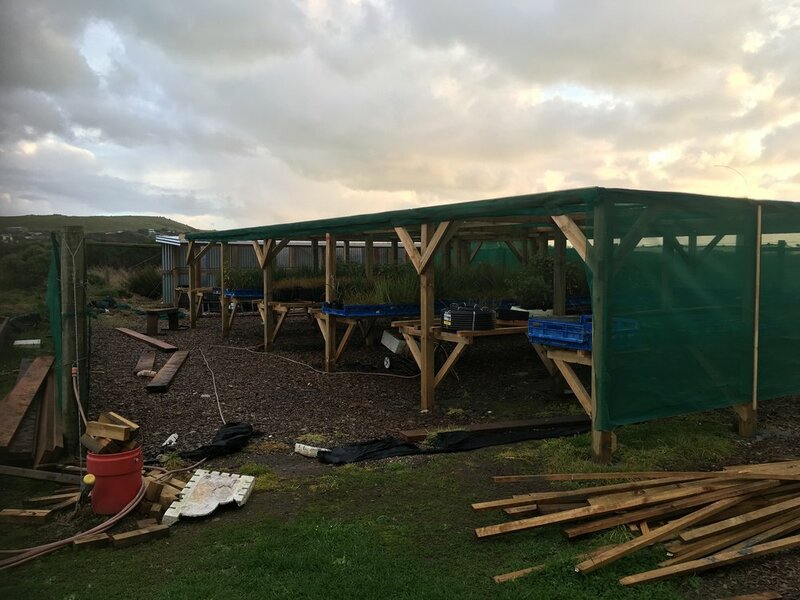 He has also worked with rakatahi school groups who have come to the marae for educational purposes – riparian planting, native plants, seed propagation. The tamariki have planted several native species in their back yard, and learnt a little about each tree. Soon they will be sowing an array of native seeds, and trying to grow 1000 trees to help restore the health of our waterways. Kua oti te whakatō tuatahi, e tipu ana te ngahere The first planting is finished, the forest is growing. Tu Pono travelled from Te Takutai o Te Titi to Murihiku Marae, for a hui on Wednesday night. This time the window on the world looks out not on to shimmering seas but lush green land that stretches as far as the eye can see. There was a full crowd in the whare that night as we shared strategies and solutions about disclosing abuse, acknowledging the hurt, finding a safe place to talk. We talked about having someone to believe in you; finding someone to tautoko you in your whānau. Some of the korero was that we give too much of ourselves for other people; we need to see the change, be the change, that we want for ourselves. One of the inspirational stories told was the transformation of the He Tauaa Rugby League Club in Invercargill. This club is recognized as the Southland District Rugby League Grand Final Premier Champions on a straight run from 2013-2016. Their club motto is ‘Win with Pride; Lose with Dignity”. Whaea Tariana also shared her memory at Murihiku Marae of having to give her first karanga. She talked about Doug Thompson turning to her and telling her to karanga while the kuia, Mihi Namana stood and called. It was a beautiful association with that marae – an association that Michael Skerrett then made even richer by describing the essence of the word ‘ka-ranga’ as standing to weave the people together. I’ve had a great week travelling around Murihiku talking with those who run the engine room to keep all our Navigators in good spirits. It is a great privilege to spend time with those who devote every day to being there for our whānau; to just keeping the door open to whomever needs to come for a kai, a korero, an opportunity to be heard. 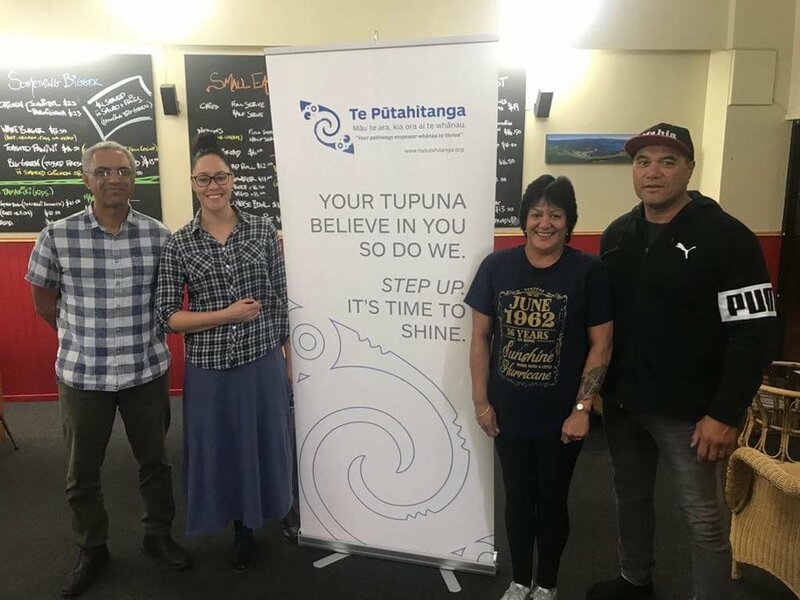 I’ve spent time with Terry Nicholas and his team at Te Runanga o Hokonui; Dolly Ngapo-Hill and the crew at Tokomairiro Waiora; Odele Stehlin at Waihopai; and Trish Young at Awarua Whānau Services. While their priorities may be different, their hearts are all with whānau. Sometimes there are crisis periods that come with the season –the family are away mutton-birding; or transitory through shearing season, and there are periods of serious hardship. 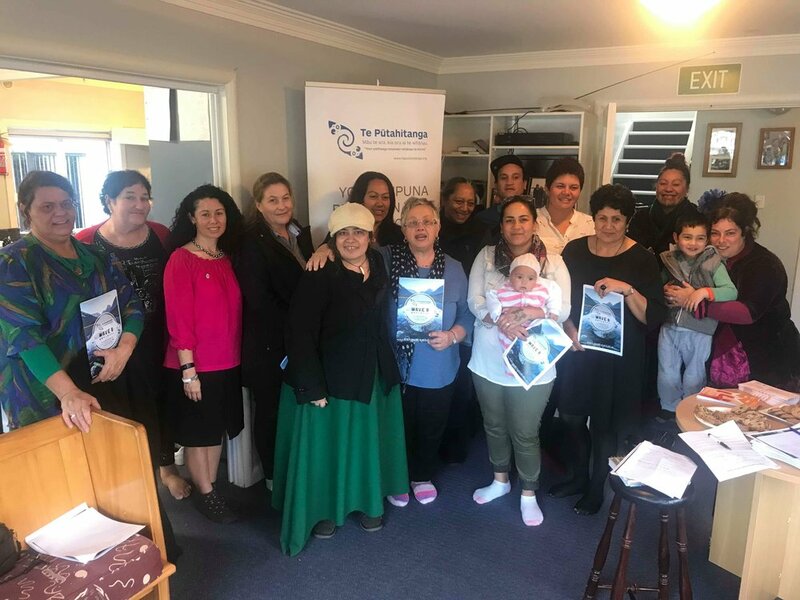 Meanwhile throughout the top of the South our Wave Eight Promo Team, ably cheer-lead by Maania Farrar, has been visiting Motueka, Nelson, Blenheim and Picton to talk about submitting an application for investment funding by 30 June. At the Nelson Marlborough Institute of Technology, Te Taumata member, Janis DeThierry gave a motivational korero to those gathered. There was a smaller crowd at the Wave café in Picton, but an equally animated discussion arose about what investment in Whānau Ora could look like. And then on Wednesday at Te Korowai Trust in Stoke (Nelson) there was a lively conversation with young and old thinking about what could be in the best interests of the beautiful mokopuna in pink. We warmly invite whanau to come along to any of the scheduled Wave 8 community hui designed for whānau who want to know more or are applying for Wave 8 funding, to discuss their application kanohi ki te kanohi and for us to answer any questions they may have. Te Taumata Chairperson, Amoroa (Molly) Luke of Te Rūnanga o Ngāti Rarua. Janis de Thierry of Te Rūnanga a Rangitane o Wairau Charitable Trust. Finally, what a thrill it was to be in the company of our Māori farming rockstars at the Ahuwhenua Trophy dinner. The Minister for Māori Development, Hon Nanaia Mahuta was there; the Associate Minister of Agriculture, Hon Meka Whaitiri; the Regional Economic Development Minister, Hon Shane Jones; the Chair of the Māori Affairs Select committee, Tutehounuku Korako; the opposition spokesperson for Agriculture, Hon Nathan Guy and the Governor General, the Rt, Hon Dame Patsy Reddy. Quite a line-up. The finalists were the proprietors of Mawhera Incorporation; and Onuku Māori Lands Trust. Moyra Bramley, the chairperson of Onuku, gave a beautiful speech in accepting the Bledisloe Cup – the winner of the Ahuwhenua Trophy 2018. Her name, itself, had great significance. She was named Moura Te Ariki to commemorate the significance of her birth-date 10 June. On 10 June in 1886, early in the morning, people living at the foot of Mount Tarawera in the heart of the volcanic plateau in the North Island, were wakened by violent shaking of the ground. Tarawera was the site of one of the most popular tourist attractions of the time, the Pink and White Terraces. Outside, the sky was lit up by lightning flashes. A huge column of fire could be seen shooting up into the air and forming a black cloud of smoke and ash. Molten rocks were flung out of the volcano, landing in the lake with a hiss. On that day, the villages of Te Ariki and Moura were both buried completely under the volcanic mud leaving behind no survivors. It was a great moment indeed, that a descendant of that tortured history could take to the speech in victory. Also competing for awards that night were Mathew Pooley (Ngai Tahu, Koukourarata); Cheyenne Wilson (Ngai Tuhoe, Ngati Awa, Ngati Tuwharetoa, Te Arawa); and Harepaōra Ngaheu (Ngati Awa, Te Whānau-a-Apanui).